Home Features Electrical Safety Are Your Streetlights Grounded? It had been raining and the sidewalk was wet. This had been one of those summer storms where the temperature outside was a balmy 78 degrees. So the children playing on the sidewalk were in short pants, some were barefoot. One of these barefoot children, eight-year-old Sarah, was chasing Eric when she slipped on the wet surface and started to fall. Sarah reached out to grasp the nearby streetlight to break her fall. But, as she touched the metal pole, she got an electric shock, causing her to pull her hands away and hit her head on the sidewalk. Luckily, she ended up with only some scrapes and bruises. But, the injuries could have been far worse. The path of electrical current from the light pole through her body did not pass through her heart. Nor did it rise to a level that would have set off ventricular fibrillation or trigger uncontrolled muscle contractions — contractions that could have prevented her from releasing her grip on the metal pole. Not this time! The above scenario is illustrative of too many cases where people and animals are shocked by coming into contact with the metal light poles used for streetlights. Some humans have died as a result. Why and how is this happening? Photo 1: This street light was supplied by a service pedestal branch circuit that did not include an equipment grounding conductor. Shouldn’t current codes and standards prevent such situations? With all sorts of safeguards in place, what sequence of events could cause such a dangerous condition to go unnoticed? Don’t contractors and installation crews know the proper rules? Aren’t there inspectors to make sure everything is built correctly? The answers are not always simple. In recent years, there have been a great number of gated or private communities built across this country. These are neighborhoods where the streets and other common use facilities may not be installed or maintained by the utility or local government as they are in public neighborhoods. Not long ago, a journeyman electrician, who had recently purchased a home in a gated community, complained about its ungrounded streetlights. Many thought he was crazy. But, he was right. The streetlights had no equipment grounding conductor (EGC) connection (photo 1). 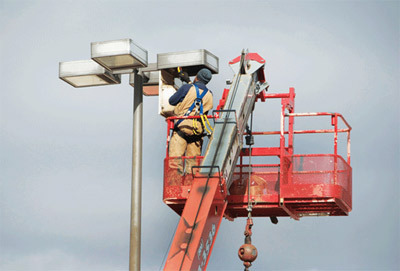 In many areas of the country, public streetlights are connected directly to the utility electrical system (no meter), with local government paying a set fee per luminaire for the electricity. Most of these supply-side-connected streetlights are not installed under the jurisdiction of theNational Electrical Code. For these installations, the National Electrical Safety Codeor a local utility adoption of the NESCusually serves as the model code. TheNECis a prescriptive code, while the NESC is a performance code. Following either one can result in a safe installation. Figure 1. A typical supply-side connection to a streetlight (no meter pedestal in between). However, it can be confusing to determine which code applies to which streetlight installations. Local laws and ordinances are often the deciding factor.NEC 90.2(B)(5) provides a list of utility installations which are not covered by the scope of the NEC. Installations by a utility on the public right of way or easements are usually done under the rules of the NESC. 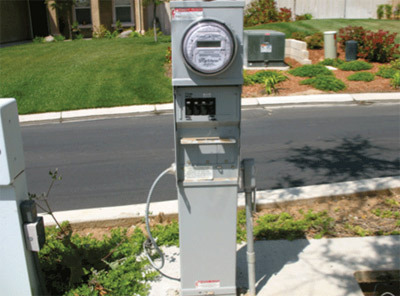 The NESC covers the installation of utility owned systems up to the service point. The NESC does not require the installation of an EGC in the utility distribution system on the line (supply) side of service equipment (figure 1). Without an EGC, protection from electrical shock is dependent on the concept of “touch voltage.” If the metal pole becomes energized through a fault in the pole or attached luminaire, the earth around the pole should be at a similar potential (voltage). The voltage drop between the pole and earth will increase as the distance from the faulted pole increases. When a person comes in contact with the pole through his/her extremities (usually arms or hands), the shock voltage is limited by the arm length, which is why the phrase “touch voltage” is used. The electrical shock voltage is limited because a person touching a faulted metal pole must be close enough to the pole to touch it, and the point where the person contacts the earth (through the feet) and the pole (through the hands) is likewise limited. Regardless, there is no low-impedance path for the ground-fault current without an EGC, so the faulted metal pole and the earth around it will stay energized until the ground fault is noticed and repaired. A person in contact with a faulted pole will probably still feel the electrical shock, but the “touch voltage” theory is reliant on the shock voltage being low enough so that the electrical current through the body will never rise to a dangerous level. The injuries and deaths that occur every year suggest that the performance standard of theNESCis not always attained. There are other variables which can affect the amount of current that flows through the human body. 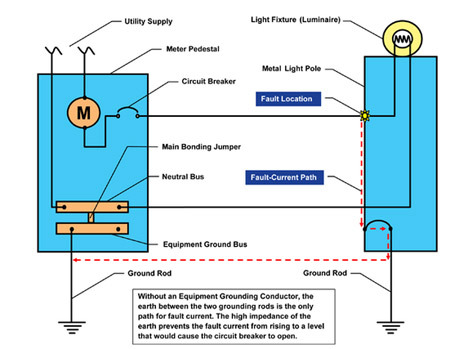 Wet earth and or a wet pole can increase the ground-fault current. Is the person barefoot or insulated from the earth by shoes? While dry skin has a fairly high resistance, wet skin or any open cuts or abrasions on the skin reduces resistance and, thereby, increases the electrical current through the body, even if the touch voltage has not increased. Streetlights serving many private communities typically get their electrical power from a metered service pedestal (photo 2). The service pedestal and load-side circuits/equipment are installed under the prescriptive rules of the NEC. 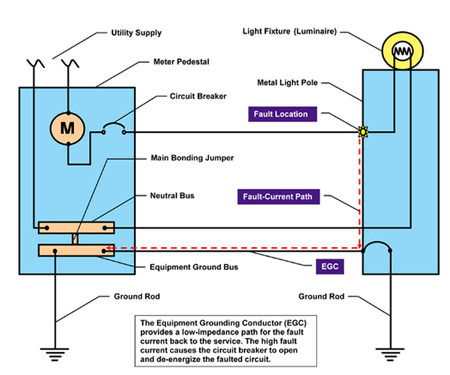 Part XI of NEC Article 250, Equipment Grounding and Equipment Grounding Conductors, provides the rules for EGC installation. 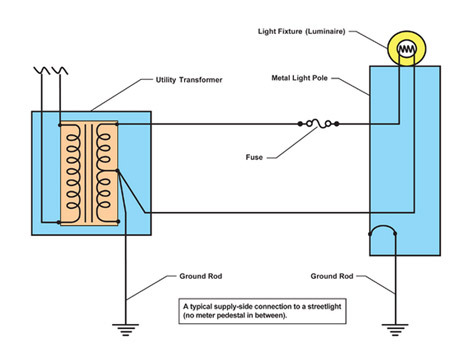 The service pedestal will have a connection point for a grounding electrode, where the grounded neutral conductor is connected to earth. A main bonding jumper is used to connect that neutral to the metallic enclosure of the pedestal. The main bonding conductor creates or is the beginning of the EGC. There are a few exceptions found inNEC250 Part XI, but, generally, all metallic enclosures that contain electric conductors or loads supplied by the service must be bonded to the service by the EGC. The EGC usually takes the form of a metallic raceway or separate grounding conductor installed with the circuit conductors (figure 2).NEC250.118 provides a list of all permitted EGCs. The key point here is that the EGC is created at the electrical service. It does not exist on the supply side (utility) of the service disconnect; it is only installed on the load (customer) side. Unfortunately, there are many instances where metal poles for streetlights located in gated or private communities around the country have no connection to the EGC. 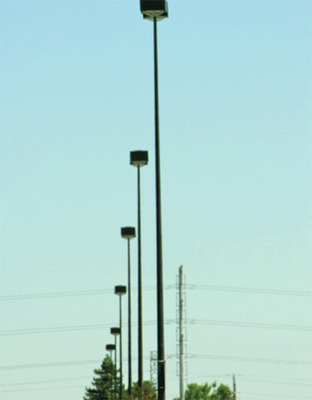 These streetlights are typically supplied by service pedestals and do not have utility-side connections. (figure 3). In two documented instances, electrical contractors who had installed street light systems did not even know that EGCs are required in PVC conduits. For many years, the contractors had been used to installing these systems on the utility side of the service where EGCs do not exist. When the contractors made the transition to installations on the customer side of the service, they were not aware an EGC was required. 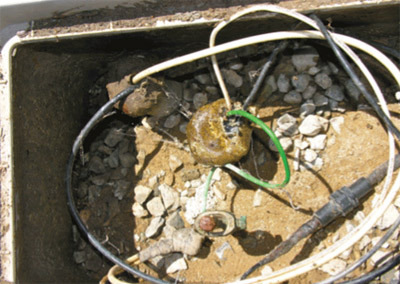 The installers thought that a grounding electrode (ground rod) installed in the site junction box, adjacent and bonded to the streetlights, would accommodate any problem (photo 3). Even a large nationwide builder-developer had to be convinced an EGC is required. 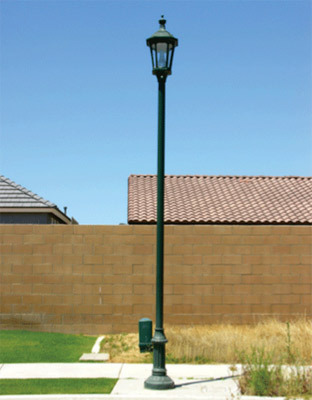 In some neighborhoods, an EGC had been installed in the PVC conduit system, but it was never connected to the light pole base or pole top luminaire(s). Since the developments were private, inspection and certification of the installed streetlight electrical systems was the responsibility of the developer’s engineer of record. But, an inspection by a qualified electrical inspector was never done. Unfortunately, situations such as this occur too frequently. Photo 4. The parking lot luminaires shown here were supplied by load-side branch circuits that did not include an equipment grounding conductor. The installers thought that a ground rod installed adjacent to each pole would accommodate the problem. Public parking lots for large “big box” stores are not immune to the problem either. A recent final inspection in one location revealed that the branch-circuit EGC was not installed in the PVC conduits that supplied several dozen 40-foot parking lot luminaires for a large, nationwide retail store. The parking lot lighting for this store was designed and installed under the jurisdiction of the NEC and was supplied by branch circuits from a metered service pedestal (photo 4). Why did the installers leave out the EGC to the luminaires? Just as with the private communities, they were confused as to the difference in grounding requirements between circuits on the load-side vs. the supply-side of electrical services. The installers also thought that, with a grounding electrode (ground rod) installed at each pole, no EGC would be needed. Auxiliary grounding electrodes are permitted byNEC250.54, but this section makes it clear that the electrode must be bonded to the EGC, and the earth shall not be used as an effective path for ground-fault current. When such deficiencies are identified, they must be corrected by installing any missing EGCs in the PVC conduits and connecting them to the light pole base ground lug and the pole top luminaire(s) and by confirming connection of the main bonding jumper in the service pedestals. Are there streetlights that receive their electrical supply from service pedestals in your community? Have the pedestals and streetlight circuits been inspected by trained, qualified inspectors? Situations like the ones described here prove the need for and the importance of trained electrical installers and inspectors. We can never become complacent and forget the basics of safe electrical installations. The bottom line is that, whether you follow the NEC, the NESC or just plain common sense, appropriate wiring methods, correct bonding, grounding and overcurrent protection are basics that cannot be ignored. Sarah and her friends are counting on it.